ace has posted a comprehensive article on The Oil Drum that details his highly documented views on the supply, demand and prices, for total liquids, crude oil and oil discovery rates which paints a rather bleak picture for our liquid supply. This figure (click to enlarge) summarizes it all for me. I know some of you will disagree with this analysis, but I challenge you to document a more optimistic scenario. Please read the whole post if you are interested. If it causes more SPHEV development and production then it's not so bad. If it causes more CTL then it is. However, I don't think these kind of predictions are accurate by definition. There's no such thing as a money machine. I am confused by the portrayal of the demand curve on these kinds of charts. How do you ever measure demand without assuming a price? For example, demand for $2/gal. gasoline is much higher than for $4/gal. gasoline, but the chart shows demand increasing regardless of price. Demand increases with price only during speculative markets and only over a short term. The normal inverse relationship between demand and price always returns once the speculation ends. This chart, by showing demand increasing forever with an increase in price, is therefore not particularly persuasive. 1) Technology improves over time, therefore it's conceivable that a single appliance or vehicle's average energy needs will drop over time. 2) Isn't the whole world looking at renewable resources at the moment? The 'demand' curve on that graph conveniently forgets that, and blindly assumes that there will simply be more ICEs sitting in traffic burning oil over time. As technology develops, again we will be very likely to see a given person's oil needs drop over time. 3) "Ahh" you say "but you're forgetting that the earth's population will grow, so even if the energy needs for a given person decline, the fact that the population is increasing will cancel out this drop". Right, well we might as well throw in the towel on any attempt to save energy if that's going to be our attitude. Why must the world's population keep growing infinitely? Has anyone found a second planet yet? Where are we meant to put these people? Where are we meant to grow their food? This is something capitalism seems to miss: As long as you have a finite planet size, growth cannot be infinite. Put a stop to population growth, and with the other two points you have a decrease in oil demand. I bet no doomsayer ever considered that as part of their 'world apocalypse' script. Yes Richard, that's bothering me too. Due to phenomena such as demographic transition and global demand (affluence) stabilisation, combined with the technology factor, total global population and energy consumption will flatten out. Off course, when that will happen is highly speculative, just like these graphical projections. 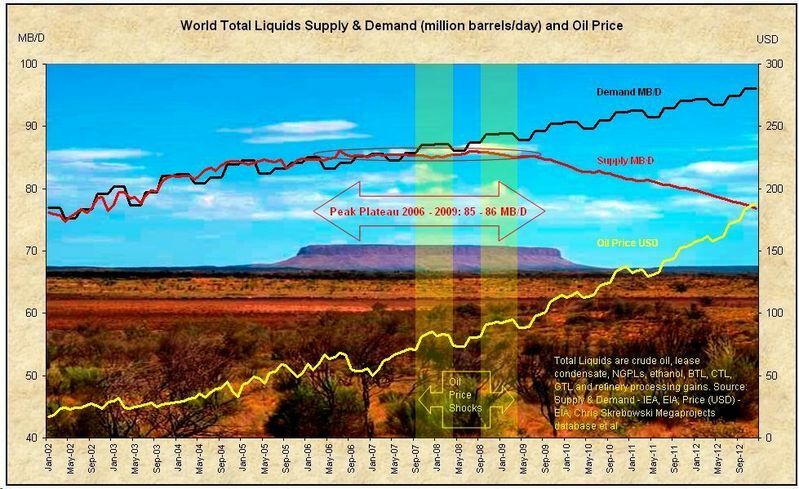 By 2012, oil may be 200$ a barrel, but it might as well be 100$. The price elasticity of oil is extremely low, not unlike many of the primary goods, such as food. People will buy it even if the price goes up. They may buy a bit less, but they will always need quite a bit of it. Primarily for fuel, but for various other purposes also. It is so vital, that prices have to be very high to make a dent in demand. Efficiency does improve, if you give it enough time. But consider that we can only replace a small fraction of the vehicles on the road every year - if we have a price shock 2 years from now, we have very limited ability to adapt with vehicle efficiency. Another way to look at it is to say that the engineering lifetime of a new vehicle is usually between 10-15 years. Thus in 2 years, 80% of the current vehicles will still be on the road. You might argue that we could replace vehicles more rapidly, but we don't have the worldwide industrial base to do this. You can argue that folks can move closer to their workplaces, but this isn't something that can quickly and easily be done on a large scale. People are looking at renewables, but in terms of vehicle propulsion, there isn't going to be anything available in the short term that will be of any help. Many ideas are still in the research labs (i.e. cellulosic), and aren't ready to be commercialized. Secondly, once you *do* have something ready to commercialize, there are often logistical problems with scale-up (i.e. tar sands) that will limit the amount that can be produced. Finally, with many of the renewables, the large scale economics is quite uncertain - recent tar sands projects have had massive cost overruns, which means that cost estimates given in the past are unreliable. For that matter, with tar sands, there are massive quantities of both water and natural gas that are required to produce the fuel, and these will ultimately be the factor that limits production. In the longer term, PHEVs and BEVs are the most promising approaches to kicking the oil habit, but all of these are still in R&D - there really isn't anything out there that you can buy today (unless you want to buy a kit and void your warranty). Yes, eventually these will probably become more widely available, but until we have the ability to produce these in large quantities, they will be irrelevant when considering fuel consumption over the next 5 years or so. Regarding demographic trends, yes, in the long run the trend can be changed. However there is a demographic momentum at play here - there are children that are already born who will soon become adults and will want to drive cars and consume useless crap. When we consider near-term trends, such as the next 5 years (as indicated in the graph that is cited), current fertility rates are largely irrelevant. 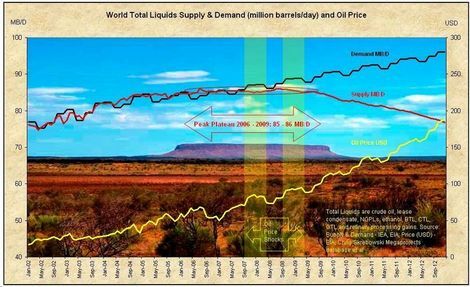 You can argue that demand is a function of oil price, and that is true. The prices that are plotted in the cited article are projected using the price elasticities that believed to be correct, and for which references are given by the author of article. An interesting thing happens with efficiency and energy use. It is called the 'take back' principle. This is also why renewable energy will only penetrate so far into the energy mix. Efficiency and energy use leads to more productive societies that can afford luxuries. My present house and refrigerator are twice as big as what my parents has when I was born but use about the same amount of energy because of efficiency gains. Hopefully we can come back to this post in 2 years and laugh at how off the projections are... they're starting to look like the climate predictions that keep failing. Excellent comments above, especially about demand. 3.1 percent, then 1.4 percent, then 0.7 percent. That is the increase in world fossil oil demand 2004-2006. See a pattern? Already, demand is flatlining. It fell by 11 pecent worldwide after the 1979 oil price spike. (BP stats, on their website) This time, we have biofuels and PHEVs. Before, we through oil demand was inelastic for a few years. We are seeing declining increases in demand now much sooner than before. The real decreases in demand are still ahead. It takes time for higher MPG cars to make up laregr shares of fleets etc. New Boeing 767s coming on, use 20 percent less fuel. We will see Peak Demand at these prices, not Peak Oil. If this price regime holds, only two things can happen: Demand declines every year, permanently, or prices crack. Look at what happened after 1979. PS The Oil Drum is run by a bunch of guys who cloak their true identities. They specialize in scaremongering. I assume they are a front for hedge funds, who are long on oil. Otherwise, why all the secrecy? Hedge funds have hundreds of billions, leveraged, bet on rising oil prices. There is $40 of fear in every barrel of oil. What happens when the fear goes away? As Eric suggests, the linear model of demand is not that crazy given that the chart only goes out five years. Benjamin Cole's comments with respect to The Oil Drum are interesting. Benjemin's comments regarding the people at www.theoildrum.com are uncalled for - essentially ad-hominem attacks based upon speculation. I have met several of them, and know about several others through their writings. None of them are involved in hedge funds. Some choose to be anonymous - some don't. Some of the most prolific writers seem to go by their real names. There are several reasons for anonymity - the main one is that there is still a lot of denial out there about the possibility of a peak, and some folks have day jobs with companies where these types of views wouldn't be taken well. I can only assume that Benjamin doesn't like the message - yeah, it is a scary message, but they have lots of solid data and analysis to back it up. The point isn't to scare but to raise awareness, and encourage people and governments to prepare so we don't get blindsided by this. Even within theoildrum, there is disagreement about various things (one recent one had to do with whether recent Saudi cuts in production were voluntary or not). The rule there is that if you don't agree with something, then write something of your own that explains your own point of view, but you must have data to back it up. Just calling them names and making up stuff is the equivalent of sticking your fingers in your ears and singing to keep the message from reaching your brain. I was arguing to say that that demand is peaking, not supply doesn't make sense to me. Ultimately we use all that we can produce so supply and demand numbers are going to tend to match. What you cannot see from this is that the *spare* production capacity has been steadily eroding - it appears right now that we have *no* spare production capacity in the world. We don't have PHEVs as of yet. A handful that have been converted here and there, but nowhere near enough to make a significant difference in overall consumption. One of the most frequently debated subjects at theoildrum has to do with how quickly overall conventional world oil production will decline once we get past the peak, and to what degree can alternatives take their places. A very complicated question - make no mistake, but we have data from existing countries that have gone past peak (the U.S. is frequently cited) to give us an idea of how quickly the overall world production will decline. Alternatives are harder - but you almost need to look at each one in turn, and estimate both the maximum production that is possible, and then take a cold look to see what kinds of scale-up problems are likely to exist. Ultimately the question we are most interested in has to do with the overall availability of liquid fuels, and the price at which it will be available. If the decline in oil is relatively shallow, it would give us time to adapt. If the decline is relatively steep, then the world economy is likely to crash. And finally the 2nd gorilla in the room - global climate change. Some of the ways we can work to solve oil shortages will make climate change worse. Some will make it better. In my view, we need to consider the two problems together at the same time. These stats are no surprise for anyone. Serious action has to be taken right now to explore alternative energy resources or else we might throw ourselves back into the dark ages. Literally. I'm not a peak-oiler (I don't know enough to have an opinion), but the direction of the demand and price curves shown (both up) is perfectly plausible over a 5 year period. Don't believe me? According to the EIA, In 2001 the total US consumption of U.S. Finished Motor Gasoline Product was 6.38 B Bbl; in 2005 it increased to 6.81 B Bbl. Meanwhile, retail prices for gas went from $1.46/gal in 2001 to $2.31 in 2005. I think that amply demonstrates a lack of elasticity in the short term, at least in the US. In my experience people haven't been driving a lot less due to higher fuel prices; they've just complained more and perhaps bought a more fuel-efficient vehicle. Besides, fuel costs are still a relatively small part of the total ownership cost of a vehicle. So much of the cost of driving is fixed (or nearly so) that the marginal cost of driving often compares favorably against other forms of transport (in the near term). In the long-term, I think the story is different; adapting to a lifestyle in the context of much higher energy prices takes time. I see demand continuing to rise regardless of price (within reason), driven by things like increased affluence & car ownership in India, China, etc. Price will just impact the slope of the curve (& whether people are buying Hummers or Fiat Pandas). they're starting to look like the climate predictions that keep failing. These are the predictions made by the voices in your head, right? The short-term response to "shocks" obviously can't be that people move closer to work or buy more efficient cars. The short-term response will be less driving. For example high-school students don't have to drive individually to school, they can take the bus. Commuters will have to carpool or take busses. For short trips people may start walking or biking. Families with multiple vehicles may use the more efficient vehicle more and the less efficient one less. Demand can be cut rapidly under crisis conditions, as it was during WW2. Obviously it would be best to avoid crisis conditions through proper planning and technology transition. Alas, it may already be too late by several decades to avoid a crisis. Demand was cut rapidly in the late 1970's; US oil demand fell by 20% from its peak in 1979 and didn't recover to that level until the late 1990's. And that was with a collapse in oil prices which brought prices to some of their lowest real levels in history. I seriously doubt, in the face of soaring oil prices, that demand will rise appreciably above supply at any time, even with declining production. People will be priced out, people will cut back, economic growth will slow or even decline and it will push demand in line with supply. Stuart Staniford is a consultant in Silicon Valley. Professor Goose is a professor in Colorado. Robert Rapier works for Conoco-Phillips. One could argue that Benjamin Cole is a paid shill of the Kingdom of Saudi Arabia, trying to keep the American public in denial as long as possible so that the remaining Saudi oil will fetch the maximum amount of money. Given the gross inaccuracies of what he posted above, it might even be true. Benjamin Cole is one of a handful of people banned at The Oil Drum for trolling behavior. Apparently a troll is someone who questions the conventional ignorance. There are those who like to demonstrate their wisdom by comment on what can not be possibility be known. A few years back, the CEO of my company (a large multi-national energy company) was explaining a major reversal of policy for the US sector. This reversal was based on the world price of coal because China was reducing coal exports. Things change and listening carefully will pay off. No, a troll is a person who repeats questions which have long since been answered, in order to stir things up. It can be hard to tell the difference between trolls out for fun and blinkered ideologues whose heads are so far up their nether orifices that they cannot even hear anything which questions their dogmas. All Kit P would have to do to challenge the "conventional ignorance" (as he puts it) would be to show how it's wrong, using facts and solid logic. But he doesn't do this. Either it is beyond his abilities, or his comments here have nothing to do with a challenge to ignorance. Exxon-Mobil pays a number of "think tanks" and others to put out propaganda to advance their interests. This propaganda must by necessity be fact-free rhetoric or based on flawed assertions and faulty logic. In other words, it's exactly the sort of thing Kit P puts out.